Let’s put aside the silly spin that Eissa was dismissed for his incompetent management of al-Dostor, or get trapped by distracting minutiae about Eissa’s monthly salary, his chauffeured car, and what have you. These discrediting attempts by al-Dostor co-owner al-Sayed al-Badawi are transparent and risible. The purpose is to portray Ibrahim Eissa as just another sleazy careerist on the take, banking on the Egyptian public’s weary cynicism about any public personage. But unlike other fake dissidents and phony self-professed gadflies, Eissa has street credibility and an unassailable reputation for service in the public interest. Ever since he was a cub reporter at Ruz al-Yusuf, Eissa had ambitions to be different, to bring down all sacred cows and smash conventions of deference to the rich and powerful. He implemented this vision when he helmed al-Dostor in its first incarnation, from 1995 until 1998, when the government cancelled its Cyprus-based operating license. Motivated by a notion of the public’s right to know—the newspaper’s tag line was and remains “popular sovereignty”--the weekly tabloid represented something entirely new in the Egyptian media landscape. It was a boisterous, opinionated, oftentimes sensational takedown of ministers and their shady dealings with emergent big business. There was next to no news reporting, the focus was on audacious exposés of erstwhile untouchables, a precursor to the adversarial brand of journalism Eissa would pioneer in the newspaper's second incarnation. When the newspaper was no more, Eissa pursued his muckraking itch in novelistic form, penning Maqtal al-Rajul al-Kabir (Murder of the Big Man), a funny, gossipy, expletive-filled whodunit set in the presidential palace. For the longest time, Maqtal was prime samizdat; in 2008, it was reissued by Dar Merit and is now widely available at all bookstores. This paradigm shift in the tolerable boundaries of political discourse was triggered by mavericks like Eissa, and later by writers such as Eissa’s fellow traveler Gamal Fahmi (Egypt’s greatest satirist, in my opinion), Abdel Halim Qandil, Magdi Mehanna, and the political articles of novelist Alaa’ al-Aswany. When al-Dostor resumed publication in 2005, now operating under license as a domestic publishing company, the Egyptian media market had dramatically changed. Privately owned print and broadcast outlets had mushroomed everywhere. Some were purposely sensationalist, like Sawt al-Umma and al-Fagr, and others were self-consciously “professional”, such as al-Masry al-Youm and al-Shorouq. A few years later in 2008, electronic media such as youtube, facebook, and weblogs became vehicles of political communication and mobilization, making possible the 6th April movement, the exposure of police torture, and Mohamed ElBaradie’s petition drive for political reform. The government monopoly on political communication had broken down; gone were the days when state newspapers al-Ahram and al-Akhbar were considered go-to sources for decoding the official mindset. The diversified media market necessitated new strategies of command and control. First, the government sponsors its own agents to enter the market and get its message across; hence the daily Ruz al-Yusuf newspaper; the daily party rag al-Watani al-Yawm; talk shows on state-owned television such as al-Bayt al-Baytak and Lamees al-Hadidi’s various inane vehicles; and talk shows like Amr Adeeb’s al-Qahera al-Yawm on the Orbit satellite television network. Regardless of his self-proclaimed status as “a media star in the Arab world” and his scripted, phony populism, Adeeb is scion of the Adeeb media empire, a family corporation that has always served the powerful and profited handsomely. Adeeb’s brother Emad interviewed Sadat and then carried out the six-hour interview with Hosni Mubarak during his 2005 presidential selection spectacle. Adeeb’s wife Lamees al-Hadidi was the PR manager of Mubarak’s campaign. Adeeb’s brother Adel heads the Good News film production company that operates several posh cinemas. Second, the ruling regime cheerily takes credit for the diversified media landscape, presenting it as a “significant result” of its political reform process. Government agents represent the hard won gains of the opposition as mere effects of government largesse. As the dutiful press attaché in the Egyptian embassy in Washington avows, “Criticism of the government, even the head of state, is now a staple diet of the media,” going on to laud the expanding scope of freedom of expression. Third, the government mobilizes its arsenal of penal laws to silence, intimidate, or wear down independent journalists and editors. 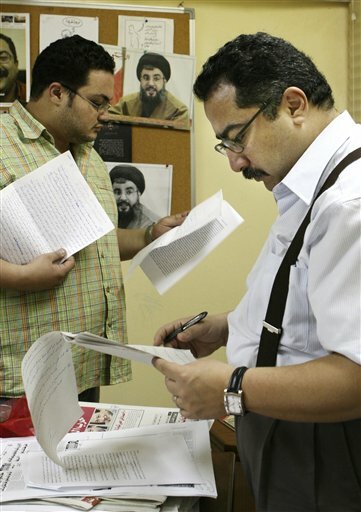 Ibrahim Eissa has been the most targeted; in 2006 he was sentenced to one year in prison (later commuted to a fine) simply for publishing an article about a citizen’s lawsuit against the president. In 2008, he was sentenced to two months in jail when he wrote about Mubarak’s deteriorating health in 2007. In one article, he wrote “The president in Egypt is a god and gods don’t get sick. Thus, President Mubarak, those surrounding him, and the hypocrites hide his illness and leave the country prey to rumors. It is not a serious illness. It’s just old age. But the Egyptian people are entitled to know if the president is down with something as minor as the flu.” Eissa was spared jail with a presidential pardon on 6 October 2008. Eissa has been removed because he’s a newspaperman with a vision and a superior communicator. When al-Dostor went daily in 2007, the paper’s diverse opinion pages were supplemented with solid news reporting that illuminated key spheres of Egyptian society. Eissa cultivated beat reporters who began systematically covering the universities, the courts, protests and demonstrations, and the Coptic Church. He continued to pack the newspaper’s opinion pages with the widest range of political viewpoints of any Egyptian broadsheet. And he managed to keep on writing his own daily column of hard-hitting socio-political commentary, all while also hosting a television show that showcased his skills as a communicator. In one clip, Eissa broke down weighty matters of political economy into an accessible, digestible, humorous module for public edification. As Egypt heads toward parliamentary and presidential elections, a time when the free flow of political information takes on heightened significance, the government is intent on controlling all sources of alternative knowledge. Newspapers like al-Dostor that pose the greatest threat are effectively shut down, via an elaborate scheme using al-Sayed al-Badawi as the agent and poor management as the pretext. For other independent dailies such as al-Masry al-Youm and al-Shurouq, they are deterred with veiled threats, inducing them to self-censor and scale back their news coverage during election season. Witness the recent series of openly threatening editorials in the government daily Ruz al-Yusuf, warning the editors and owners of all independent dailies and even threatening them with disappearance by 2012. For the broadcast media, new regulations have been handed down prohibiting the filming of courtroom proceedings. Little to no information is released about the Higher Elections Commission, the new body tasked with overseeing election supervision after judicial monitoring has been scrapped. And new regulations on election candidacy are issued by the Interior Minister in virtual secrecy, without publication in the official government press.